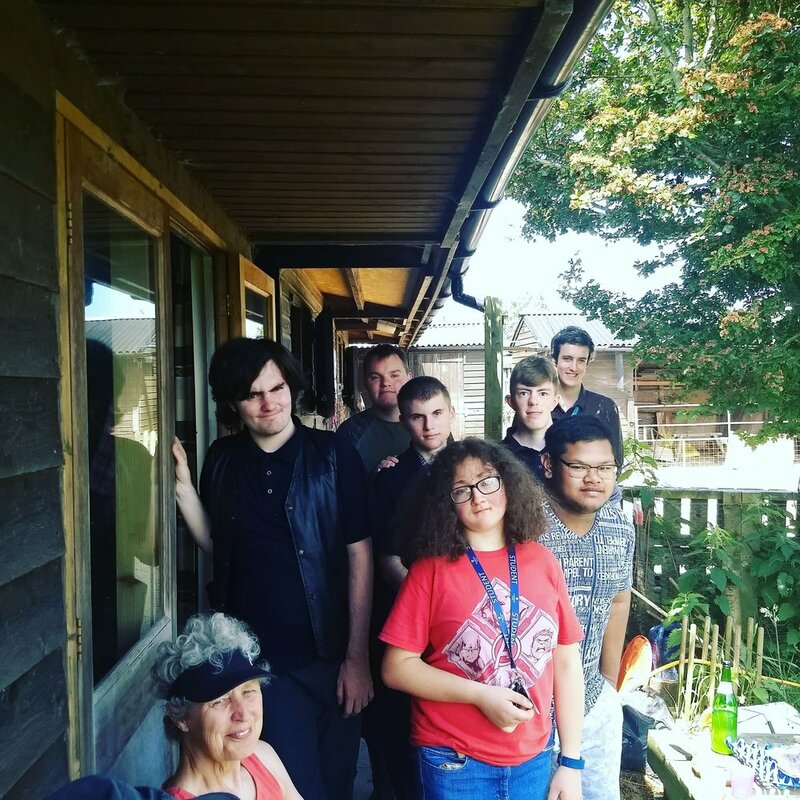 It was a hot day and we all knew it was going to be a poignant session with the Bluebell House group at Baulcombes Barn, because it was the last one to be held here. Flourish funding comes to an end in August 2018, and Bluebell House is moving to Horsham. As Owena pointed out, members of the group have gone from being anxious around the animals, to being confident and assured, and that has been a pleasure for all of us to be part of. Lunch was going to be a late one, so I made drinks and shared courgette cake to tide everyone over. Since Rhiannan has done the Erasmus cookery course in France, and has developed her skills and confidence as a chef, she kindly agreed to be in charge of cooking over a firepit for the celebration meal, with myself in a supporting role. Before we lit the fire, we brought two buckets of water over, just in case there was an issue with the ground being so dry. From her farm, Owena had provided hogget burgers, sausages and boiled eggs. Rhiannan had made rose harissa koftas from hogget mince and made pittas to put them in, with yoghurt dressing and pomegranate seeds. Also, she'd made halloumi and watermelon skewers for the vegetarians, and a lovely salad made from fennel and other delicious things. Sue had brought courgettes and beans from her allotment, and we cooked those in foil in the fire. I brought apple juice from Ringmer Community Orchard, which is special and went down very well indeed. Whilst Rhiannan and I cooked near the pond area, everyone else spent time with their favourite animals, saying goodbye. Then we gathered to share a delicious meal, before going inside for a final check in. 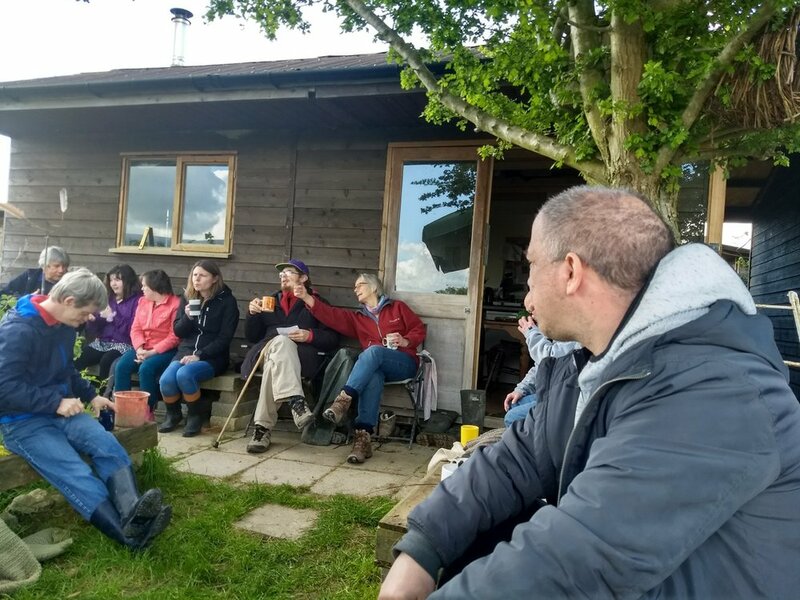 I gave out the gifts of mugs, tea towels and framed prints of the cartoon of the farm Flourish had had made, and the group gave Owena a wonderful pyrography picture of a pony as a thank you for being such a great group leader. Owena praised everyone for coming to what we all knew would be a painful session. Endings are never easy. It has been a pleasure working with the wonderful members and staff of Bluebell House, and Owena has been a wonderful person to work with. We've all learnt so much. Thank you to Rhiannan for her amazing cooking! Owena will be doing two weaving sessions at Bluebell House in August, and Emma will come to the second one. 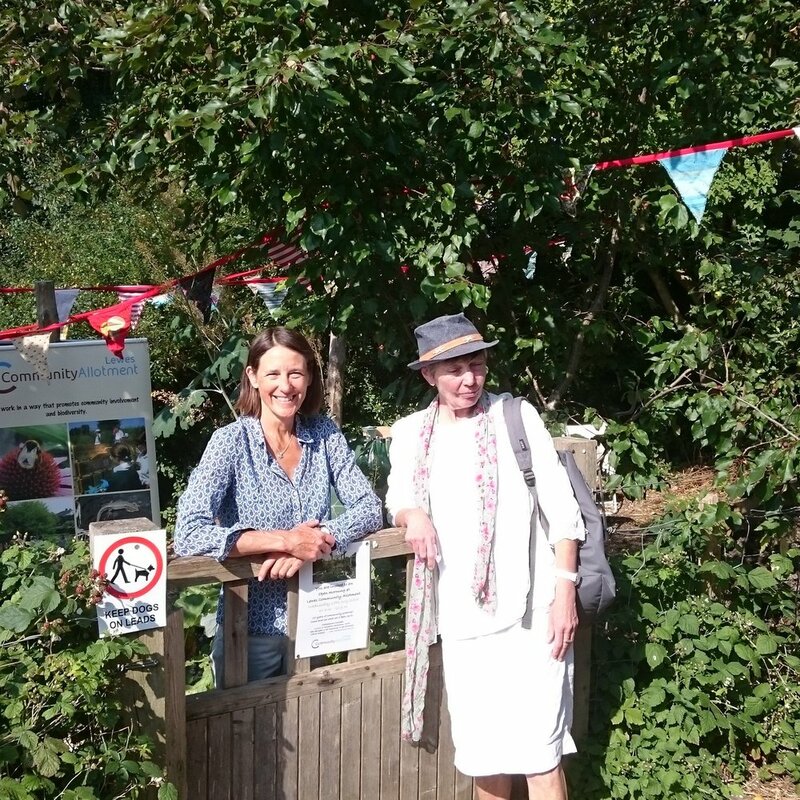 What a hot day, but a beautiful one for the 20th anniversary celebration for Lewes Community Allotment. Sarah had done lots of preparations for the event, with great support from Felicity Ann, Penny and other members. On the day, Maggie, Mark, Sue, Common Cause director Topsy, myself came early to help make it look beautiful, with bunting, displays and refreshments. Penny with trim for Emma's hat! There was a stunning array of lovely homemade cakes and other treats brought by members, including courgette, carrot and marmalade cake. Drinks included elderflower cordial and apple juice from Ringmer Community Orchard. 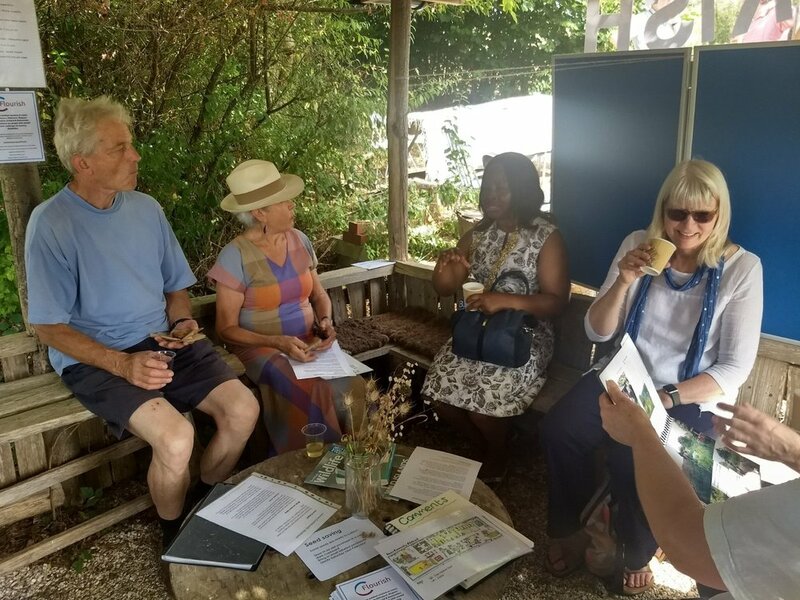 We were joined by the Lewes Mayor, Janet Baah, her PA Fiona and Allotments Secretary Emma, who came to celebrate with us, to show their support of our work, and admire the displays. During the morning, we had lots of other visitors drop by to visit the site, including the Edible Eastbourne team. A number of people expressed an interest in becoming members. Our shed boasted a lovely display of Maggie Lambert's fantastic photos and St Nicholas Day Centre drawings. Unfortunately, support staff there felt it was just too hot for them to attend safely. Thanks to everyone for coming, and to everyone who helped. Lewes Community Allotment was originally known as Lewes Organic Allotment Project, or LOAP. It was created by Common Cause Coop in 1998, through the hard work of a group of local people. We've had help from Lewes District and Lewes Town Councils as well. We've had funding from different sources, for example, from the Lottery to create the raised beds suitable for people with mobility problems. We have a membership of people who work with us to manage the allotment. We developed workshops for children called The Lottie, working with Lewes schools for 10 years. The Compost Doctor scheme and Wild in Lewes springboarded from here. 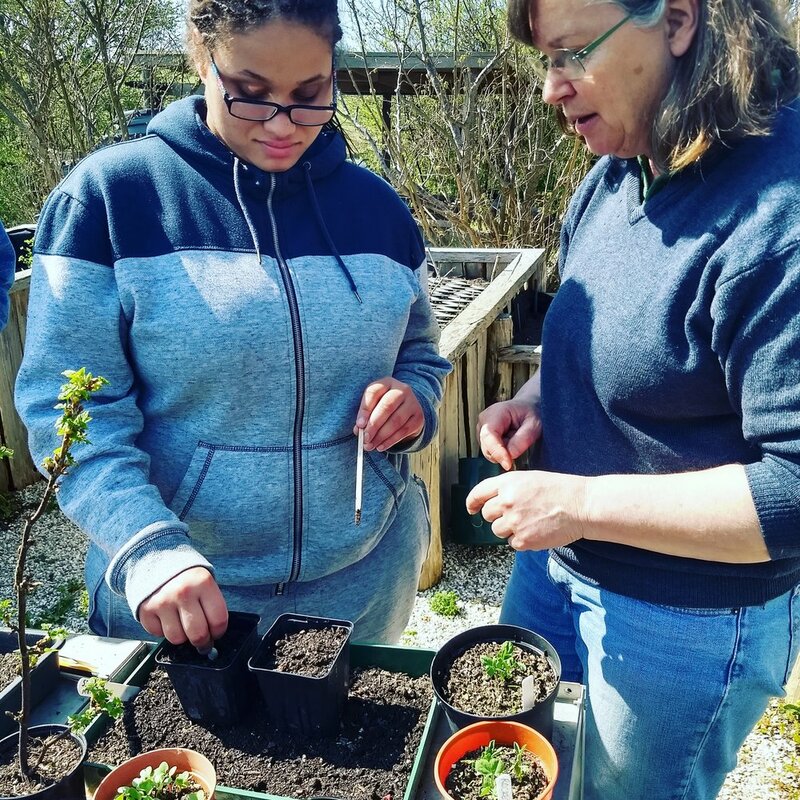 We have evolved to work with groups of people of all abilities who look after the plot, learn about growing through our social and therapeutic horticulture sessions, and take fruit, vegetables, herbs and flowers home. We are lucky to have a fantastic Sessional Worker, Felicity Ann, and a wonderful volunteer, Penny, who support our work. 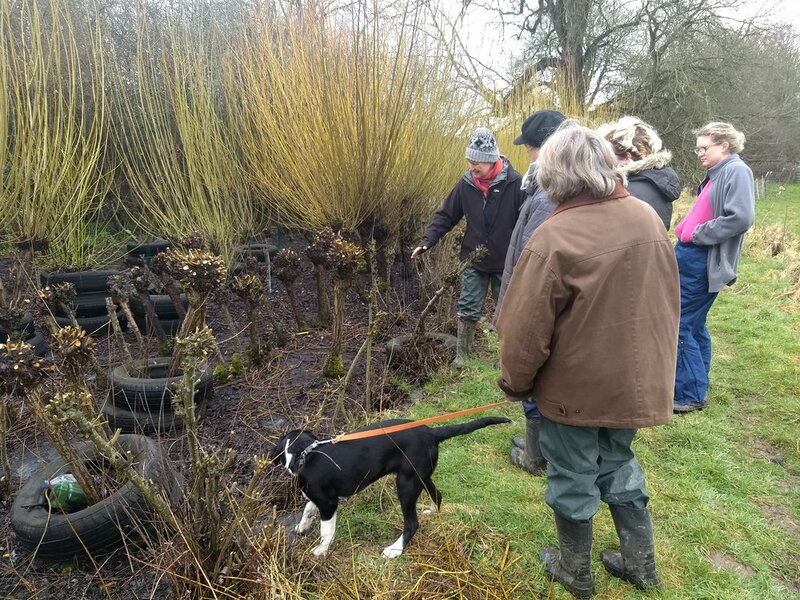 We also bring in other specialist trainers at times, such as James from Square Lemon Training, who demonstrates safe handling techniques, and Peter May, an expert on apple trees and pruning. We continue under the management of Common Cause Coop, and are currently Reaching Communities Lottery-funded through the Flourish Project, and hope to continue working with groups of people with learning disabilities from the St Nicholas Centre, Plumpton College, as well as other groups and individuals in the coming years. We use organic methods for pest control and feeding plants. Barriers such as wood ash and wool pellets deter slugs and snails, netting keeps cabbage white butterflies away from brassicas. There are three small ponds which help to support the team of natural pest controllers - frogs, toads, slow worms, lizards and birds which come to drink. Around new seedlings, we may use organic certified slug pellets to get them started. We also start seedlings off at members’ homes to give them a chance to harden off. Native wild flowers and some ‘weeds’ are left to grow, along with green manures to help foraging pollinators. Many different types of solitary bee visit the plot, including masses of red-tailed bees. In the winter, we all get together to discuss the successes and failures of the year, and plan our next round of growing on 'big ideas' sheets. 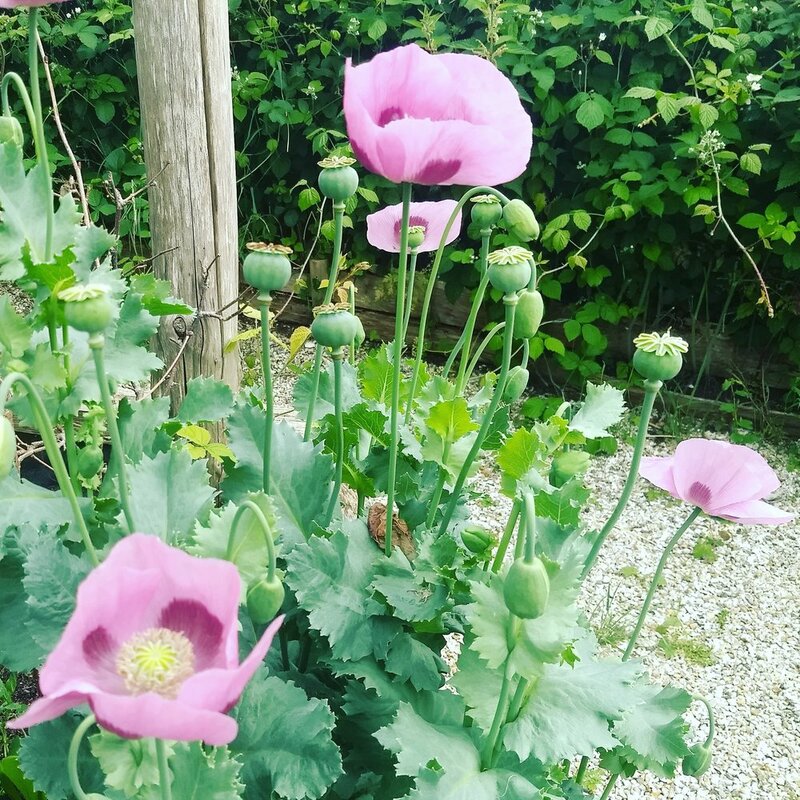 We also choose other activities to try, such as local craft skills, art projects, wildflower walks, but particularly things connecting to wildlife. If you are interested in coming to sessions, we currently meet on Wednesdays. How are you going to get the potatoes out of the boxes? Luckily there was a bit of cloud cover on this particular mid-July Wednesday morning, because very hot weather can make it tricky for the St Nicholas group at the allotment. Sarah and Felicity Ann had prepared some activities in the shade, including digging potatoes, looking at some of the reference library and making/decorating name badges for the Allotment Open Morning on 25th July. Some people did some trimming back of brambles and clearing, tidying up the entrance area to the Allotment. It was a blistering hot July Wednesday afternoon. The ground was dry and hard. Bluebell House arrived at Baulcombes Barn for one of only a few more sessions they have with us. This is partly because Flourish funding is ending in August, and partly because the centre is moving to Horsham. In any case, endings can be hard for everyone. This group have developed important bonds with Owena and the animals. 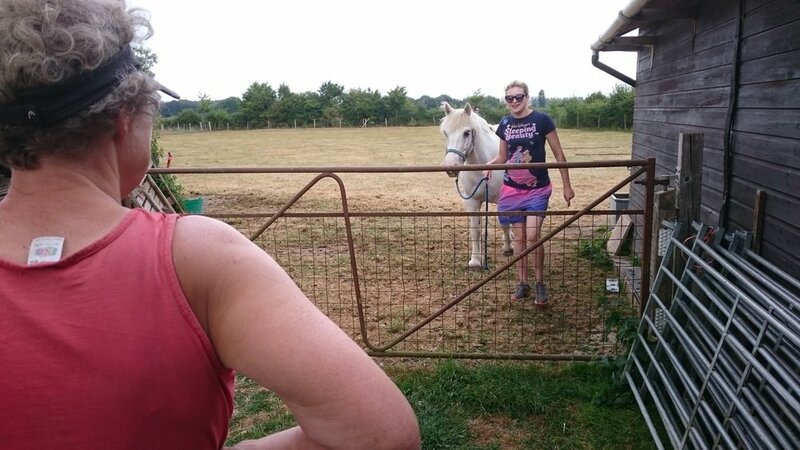 I came along to spend some time with the group, as I sometimes do, bringing medicine from Cliffe vets for Tallulah the pony, as requested by Owena. And some cake for the humans! I also came because Flourish want to give every Bluebell House member who has come to the farm a memento. I had samples of a mug and a tea towel with the design created by Michi Mathias (see above). Everyone who was present really liked them, thought about what they'd like and put in their orders. Joanna will ask others at Bluebell House and let me know. We then "checked in" ie went round the group and said how we felt. Owena gave everyone an update on the farm and any animals news since the group were last here a few weeks ago. "I took some of the pigs to the Smallholders Show. Because of the heat, we have to be here by 8am every day. The animals seem OK. The sheep stay in shade. One young ewe got mastitis, and we treated her with antibiotics. She's still not quite right, so we're keeping an eye on her. We moved the sheep on foot to a field nearer to the therapy room, so we could shear them. We were going to shear them today, but then I realised a fox had got into the community chickens and killed some of them. Foxes are hungry at the moment, plus we've got problems with the electric fence, and the earth being very dry doesn't help. I found where the fox got in. Helpfully, the pigs, who normally try to dig themselves out, can't because the ground is too hard. 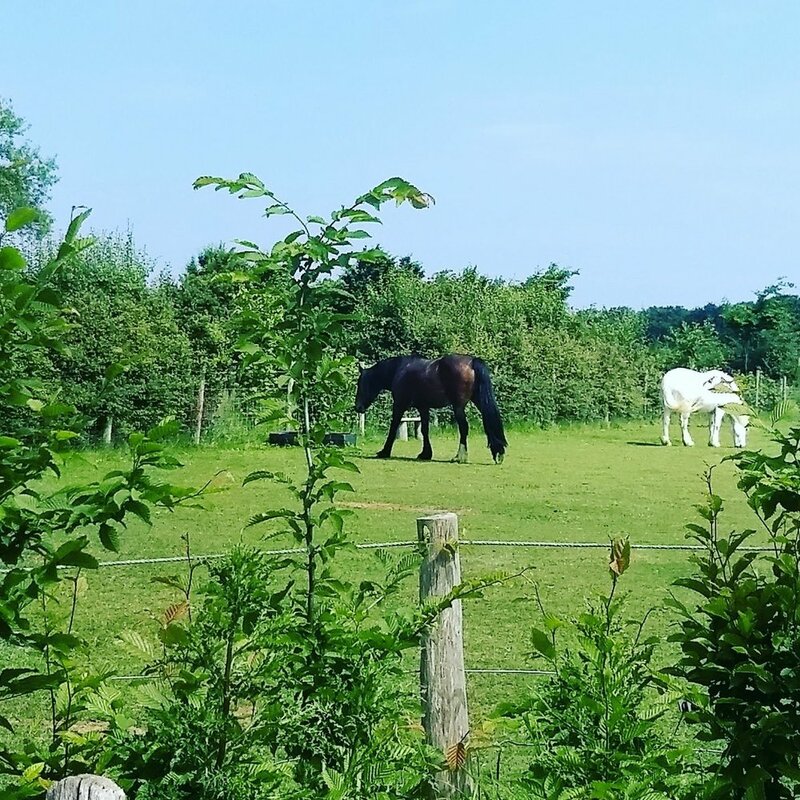 And the dry weather means the grass is less sugary, which is better for the ponies. They don't get laminitis. Finally, we've had an issue with broody hens. One booted another out, then didn't take care of a chick that hatched. I'm keeping a close eye on things." Then we went out to do some chores, which included: catching up the ponies, grooming them, leading them around the field, extending the grazing area for the ponies by moving the fence, giving the pigs water, cleaning the pony fields, feeding the hens, and collecting up and soaking willow for a future willow weaving session. You can can see some of those activities in the photos above (since several members of the group prefer not to be in photos, so we've been careful who is in these). "I was grumpy earlier on, but being here always helps me feel better." "I'm glad to be here. It always helps"
"I was feeling crappy but I'm glad I came today." 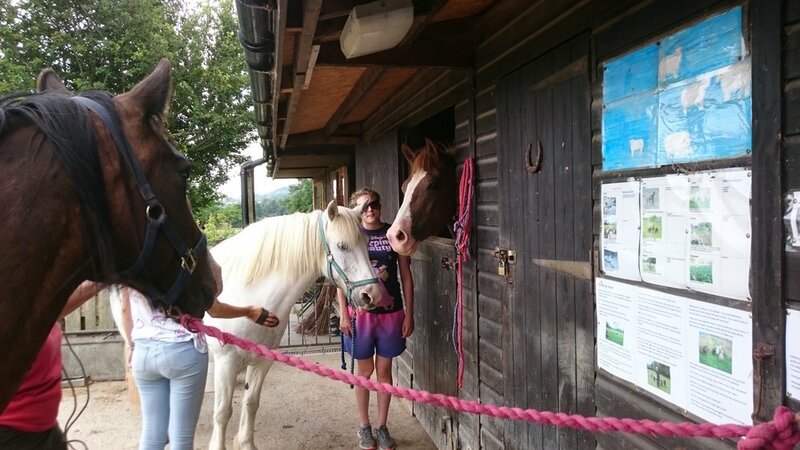 Owena from Baulcombes Barn brought three Bluebell House members along to Ringmer Community Orchard for a very special reason. Baulcombes regulars Ash and Sue, along with Paul, have developed a keen interest in pyrography, also called poker wood, or wood burning, which is creating art in wood by burning a design with a hot tip. I was hugely impressed. It's a wonderful piece of work, with beautiful apple designs. The lettering must have taken a lot of work to be so accurate, neat and well-spaced. 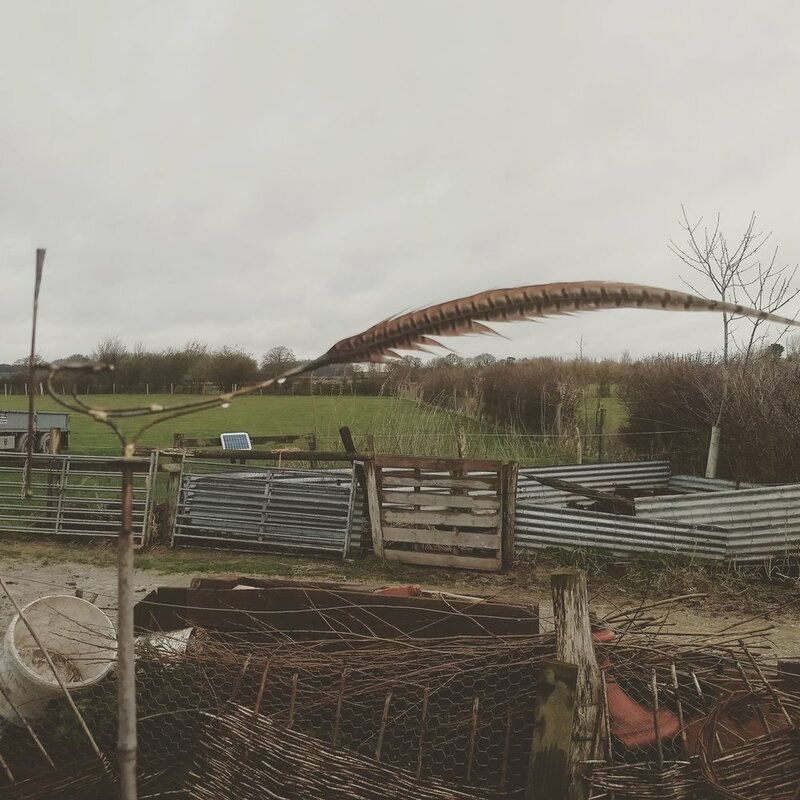 "Last year Ben, Bluebell House Occupational Therapist, asked us if we'd mind creating a sign for Ringmer Community Orchard, after Flourish asked if it might be possible, having seen one we'd done for Baulcombes. " "It took about two and a half months, which is nine or ten sessions. We all had pyrography machines and worked on it together, three at a time. We bought the wood online. We wanted something to last. This is birch ply. It's nice and thick, which is good for pyrography. " "It's the first time we've tried something so big. We have tried pine in the past, but it was too soft." "In terms of the apple designs we chose, it was a joint effort. Sue drew the designs on paper. We all chose the font. Natalie from Bluebell House printed the letters off for us. We wanted it to stand out. Paul did all the measuring to fit the letters in. We traced the lettering because we found that using graphite paper didn't work." "We did the burning together. Then we put on about three coats of varnish - and the varnish does pong! You've got to be careful about breathing it in. We kept it in a separate room." "The last piece we made was a 5th birthday design for Bluebell House." "We've really enjoyed it and us doing pyrography has inspired other people to do it at Bluebell." Owena took a look at the sign to see if she could put it up there and then, but, looking at it, we all felt it needed some extra bits of wood to fix it properly to the gate without putting holes in the sign in a way that would spoilt the design. So that will happen at a future date. Owena had bought some art supplies for Emma to present as a thank you from Flourish to Sue, Ash and Paul for all their incredible hard work. Katharine and the Orchard members will be hugely delighted to have such a wonderful sign. We had our last session with the Plumpton College Rural Pathways students at Baulcombes Barn on Friday. First of all, the group fed the pigs and tended to the hens as usual. Then they came back to the pony field area to clean that (and meet Ben, the new pony) and remove some posts. 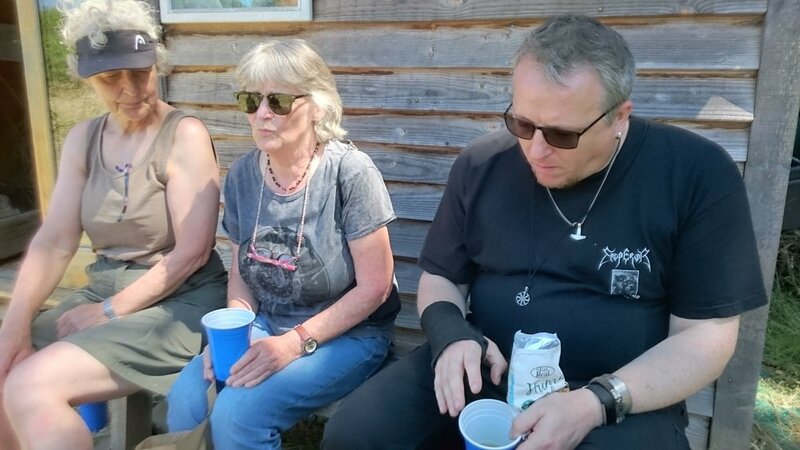 They had a break for a drink of Ringmer Community Orchard apple juice first because it was hot. Emma and Mark Gilbert took students aside one by one to do a feedback exercise. Rhiannan from Bluebell House was kindly there to cook food for our end of term celebration over an open fire by the pond, because she's great at it. She recently did an Erasmus cookery course in France. Rhiannan fried onions and made a fantastic salad with finely sliced fennel and lots of other interesting and delicious ingredients. Mark, who has excellent skills in this area, helped her with the fire and the meat cooking. Rhiannan has developed an interest in meat and butchery and is talking to Owena about it. Owena had provided sausages and burgers from her own animals, and bought locally made Mamoosh pittas. First we presented the students with their certificates. Owena and Ivan have been very impressed by how hard the group have worked. So Emma created certificates which told each person what Owena and Ivan thought were their strengths, and then she read all of these out before giving them out. Then we ate a delicious lunch by the pond. It was a beautiful setting. Niyati had brought Owena flowers and elderflower cordial. Emma had brought a carrot cake by Felicity Ann, sessional worker at Lewes Community Allotment, for afters. Everyone thanks Owena and Ivan, and Rhiannan. What a lovely term it's been. We wish all the students the very best of luck in the future. We had our last session with the Rural Pathways group from Plumpton College at Lewes Community Allotment. There were some challenges to navigate. 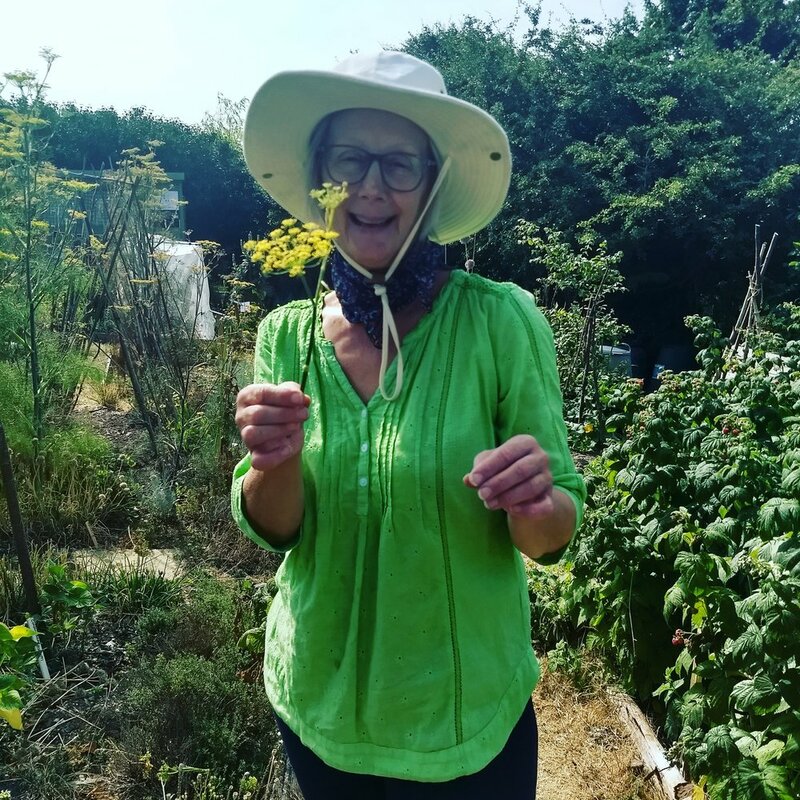 The allotment had a wasps' nest, in the raised beds and Sarah was awaiting someone from Lewes District Council to sort it out. The students came later than usual because some of them had been taking part in a football match. Niyati and Pat brought Sarah some beautiful flowers. Common blue in the new loo! But it was a lovely afternoon. We decided to spend part of the time doing some feedback with Niyati, Pat, Emma and Mark Gilbert. Then we had a celebration. Emma handed out certificates to all the students and thanked them for their hard work on behalf of Flourish, then we all enjoyed some of Felicity Ann's delicious carrot cake and jam tarts. Pat had made some elderflower cordial which was lovely. 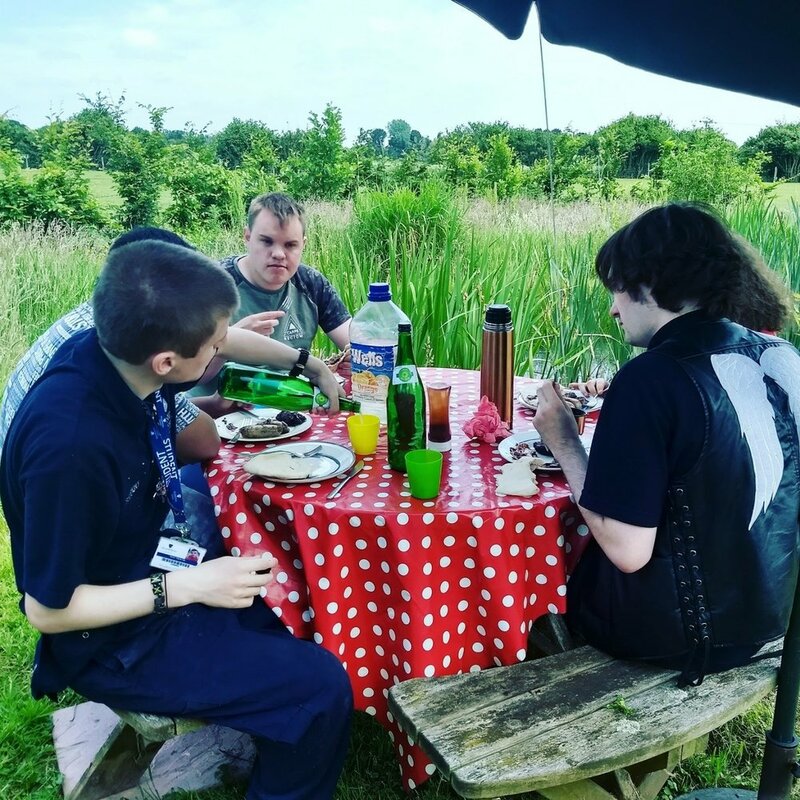 Some of the students had brought treats to share, and we also enjoyed some apple juice from Ringmer Community Orchard, which was great on such a hot day. Emma went through the students' workbooks that Niyati had brought along, and was really impressed by their work. Some allotment members came to say hello and join in, and it was a really nice. We wish all the students well in their futures. Today was a little challenging, because Sarah discovered that we have a wasps' next at the allotment, in the raised beds, so Sarah was very careful about working with the new St Nicholas Centre group away from that area until the Council are able to come (later in the day) to sort it out. So, after taking the register half way down the plot, Sarah explained the Golden (safety) Rules to the group. These include being careful where they walk because the ground is uneven, not taking tools from the shed (Flourish put out the tools that are needed), wearing gloves when working with soil, washing hands, not running, being aware of the ponds etc, and reporting any injuries immediately to a staff member. Then Felicity Ann handed out paper and pencils, and the group drew flowers, insects, birds, foxes. Whatever they wanted to. Sarah asked what colours they noticed. People mentioned red, green, white, orange, yellow and purple. After that, Felicity Ann and Sarah took the group for a little walk to look at other allotments. We asked local illustrator and cartoonist Michi Mathias to represent something about the positive impact Flourish sessions has on our clients, but in graphic form. This is what she came up with, using quotations from members, and featuring Owena's brahma cockerel from Baulcombes Barn, Tallulah the pony, as well as some of the pigs and community hens. We absolutely love it, it's so beautiful and says so much about what we do. It will feature in our final project evaluation for the Lottery. The old shed comes down at the Allotment! Farewell to our old shed, which has served us well for 20 years. The Conservation Volunteers dismantled and took it all away, they did a brilliant job! We decided to celebrate three years of the Flourish project with a display in one of the Lewes Tourist Information Centre windows. The Lewes TIC is situated in the centre of town, so lots of people see it, and many service users can take a look as they pass by. Emma trying to take a photo of the wonky veg through a reflective window! 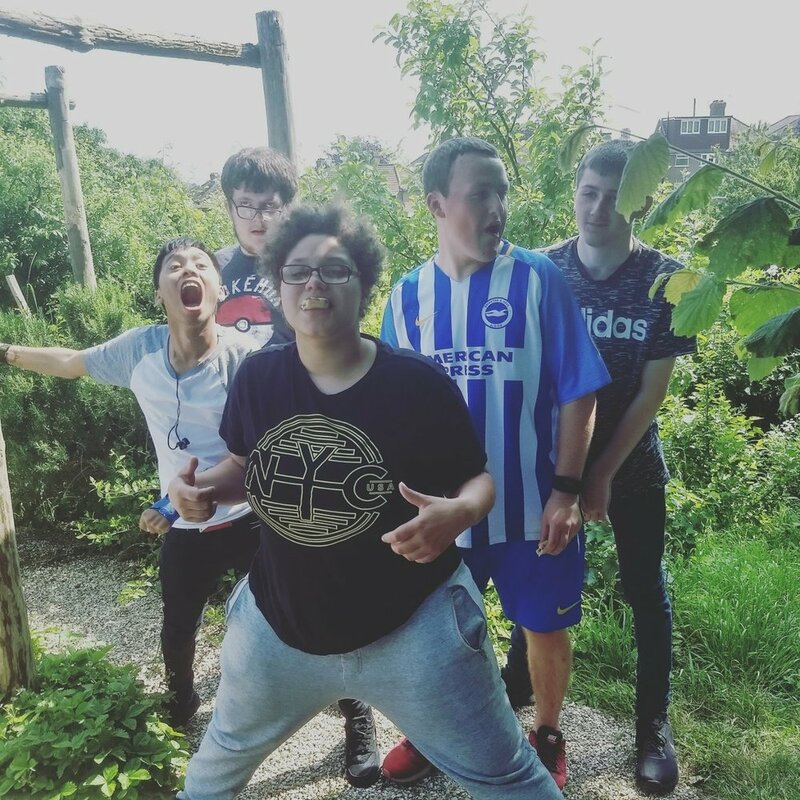 We wanted to involve users in the display, for it to be entertaining and engaging, to tell a story through pictures, in the most part, and to show what we do, offering positive images of people with learning disabilities and mental health challenges at the sessions that we run at our three sites. We included quotations from service users about how they'd felt after their sessions in the 'clouds'. The overall look of the display was designed by graphic designer Suzie Johanson. Photographer David Stacey helped with lots of the planning and thought processes, and did a fantastic job compiling letters of the project using photographs. Michi Mathias created the pictures of the horse and stable door as well as the apple tree and apples that you can see in the photos, representing Baulcombes Barn and Ringmer Community Orchard. Lewes Community Allotment is in the centre, represented by a hazel obelisk, as well as two watering cans, two trugs (one full of knitted fruit and veg on loan from Brighton and Hove Food Partnership), and various gardening tools. A team of myself (Emma Chaplin, project manager), Suzie, Michi and Lois gathered at the TIC with handfuls of props to set everything up. The TIC kindly lent us the astroturf, and we used the struts and fishing line to dangle everything. We stuck the photos up with push pins, added apples with blu-tac (which I got upsidedown to start with!) 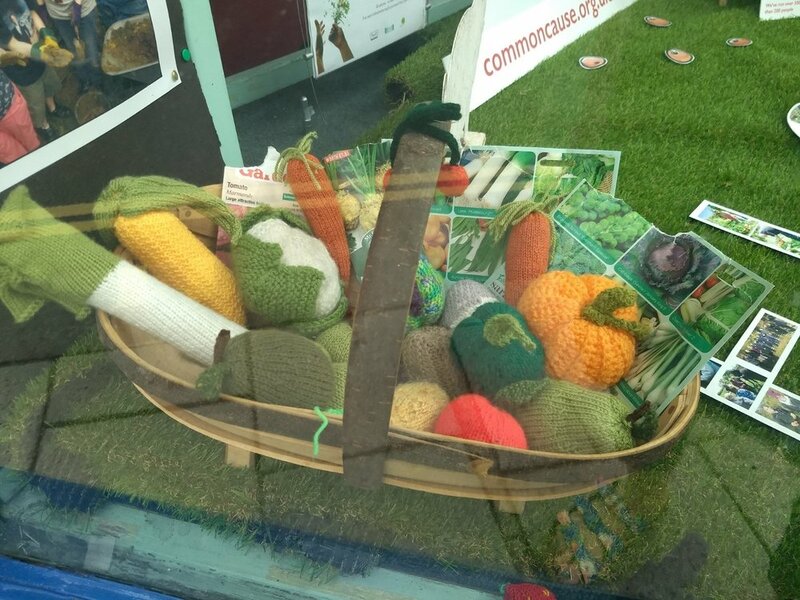 and laid out all the other bits and pieces, adding straw and the knitted veg. 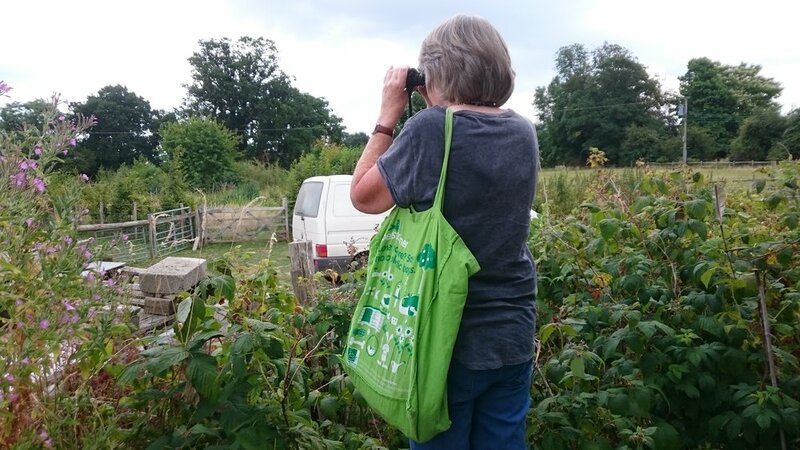 We've included a number of wildlife creatures we see at the allotment in the window for people to find - including a blackbird, a caterpillar, a bee, a hedgehog, a lizard and two butterflies. Michi also created a fantastic poster which features various animals from Baulcombes Barn as well as quotes from members of Bluebell House Recovery Centre, who attend regular sessions. Huge thanks to everyone who helped! It was Maggie's idea to do it in the first place in the TIC. 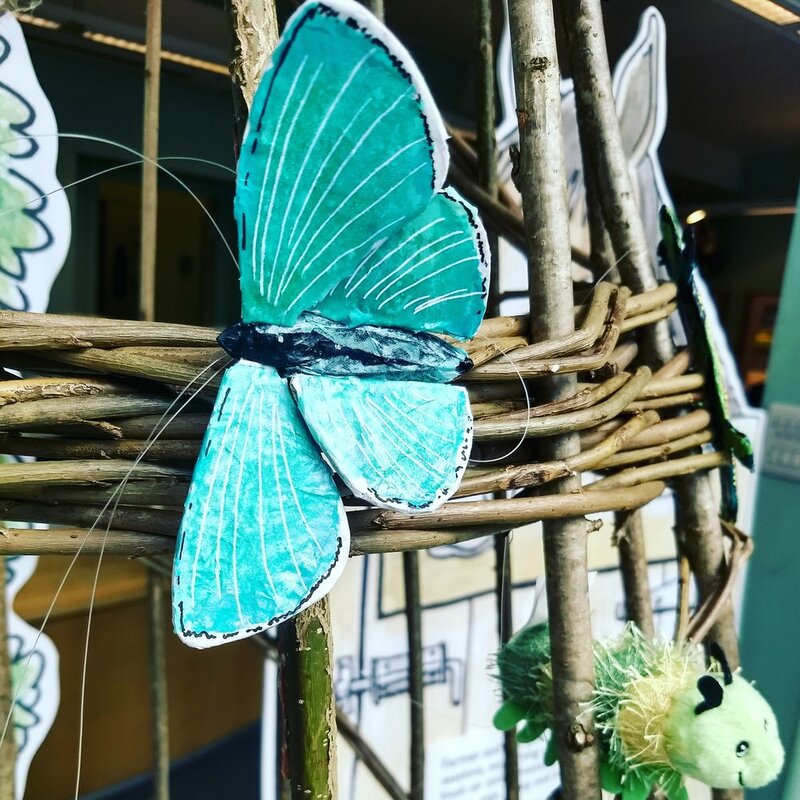 Thanks to Lois Parker, for the great butterflies and lizard, and for helping out with the window set-up. James McCauley, who heroically helped with sorting, editing and printing all the project photos (on the post on the left hand side). Arnold Goldman lent us a trug, as did Anne Turner. Janet Sutherland lent a watering can and old seed packets. Billie from Leadbetter and Good, who lent us the pig. And thanks to everyone in the Tourist Info, who have been so helpful and supportive. We haven't had the best of luck with weather in terms of visiting The Secret Campsite in Barcombe. It was unbearably hot last summer when the St Nicholas Centre group visited. And this time we had quite a lot of rain. What WAS it we saw? Michael, Tim and some fierce axes! But Eleanor of St Nicks and the group (which was the usual Wednesday allotment group, plus some previous St Nicks allotment attendees) said they were happy to wear raincoats and come anyway, and neither Tim, who runs The Secret Campsite, nor our (Sussex) Wildlife friend Michael Blencowe, wanted to let rain stop play, so we decided to make the best of it. Tim and Michael know each other of old. First of all, we all gathered in the reception building of The Secret Campsite where Tim greeted us, and Michael jokingly mentioned what we wouldn't be able to spot on this visit. Butterflies in particular. But what we could do was look under the snake boards to see who might be sheltering. So we put up our hoods and headed out. Michael was sporting an excellent, waterproof poncho he told us he'd won in a raffle. He explained that The Secret Campsite is well known for its wildlife. They have a Wildlife Festival every year. They have bat boxes, for example, and a pond. We began by looking up at various bird boxes tucked under eaves. Then we walked further into the campsite to find and carefully lift each of the snake boards (boards which warm up when it's sunny, which snakes and other creatures like to hide under). First of all we spotted several wood mice scampering off, and saw their nest surrounded by cracked acorns they'd been eating. We saw a friendly toad (which Michael picked up carefully to show us). In total, we saw five slow worms and a common shrew. A lot more than we expected. We walked into the woods for a brief look at the bluebells. We noticed the the fire point on the way, which has a dampener in case camp fires get a bit fierce, then buckets of water and fire extinguishers. Plus there's a alarm bell you turn by hand, that a few members of the group had a turn on (there weren't any campers to scare!). We had a look up at a tree tent, Michael and Miles had a little kick about with a football until everyone caught up, and finally we went back to the main building for elderflower cordial and biscuits. Plus a look at an animal skull and some handy pictures of animals that you might see at the campsite. For fun, Michael wrote the names of all the members into the tree-named plots on the empty camp plan, with some sketches of creatures we'd seen. It was great, despite the rain, and it was lovely of Michael to come along to talk to us, and for Tim to host. The Rural Pathways group worked again as a great team, catching the weaners in the trailer. Some of the group mixed the feed while others prepared the trailer. The weaners were enticed into the trailer, and two members kept the gate closed. We sorted out the males and females and then drove the girls in the trailer to their new enclosure. Straw was put in the ark to keep them warm, the gates were secured so they would not try and return to the boy pigs. Follow up, no escapes until Sunday afternoon, one girl weaner had got out, but was very keen to return to the girl enclosure. The electric fence needs to be put up! Chickens, lambs & a puppy. Our St Nicholas group visit Baulcombes Barn. 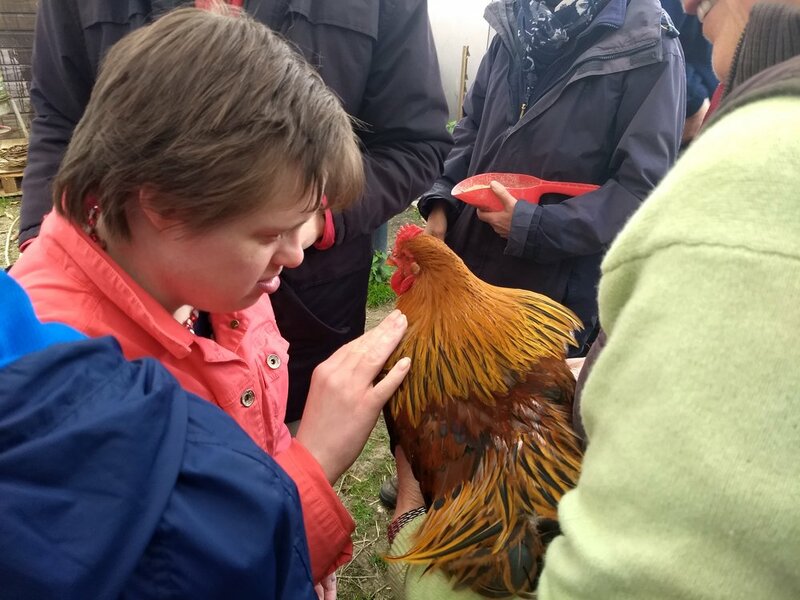 Our regular allotment group from the St Nicholas Centre really enjoy visiting the animals at Baulcombes Barn, so Owena agreed to host them on (mostly) sunny April day, so they could see the newborn lambs, groom the ponies, see the broody hen and much else besides. It was lovely for us to see some old faces get off the bus with support worker Eleanor, as well as members of our current group. Volunteer Penny and sessional worker Felicity Ann came along too, which was great. Penny and I made some drinks (tea, coffee, and homemade elderflower cordial), then we sat outside the therapy room, those who wanted to taking turns to hold Dottie the puppy, whilst Owena explained the safety rules of the farm - washing hands after touching the animals, not eating near the animals, and being quiet and gentle around them so we don't alarm them. We watched some swallows fly down into the stable roof - Owena explained that they had arrived after their winter migration a couple of days before. Then we went to see a broody hen on her eggs, fed the chickens, collected some eggs, held the cockerel and a hen, saw the lambs in the field, watched whilst Owena caught Tallulah the pony, stroked Buster, said hello to Frankie, and finally, those who wanted to, groomed Tallulah in the yard. Lots of interesting questions were asked during the visit. Do horses prefer apples to hay? (Owena said they mostly eat grass now they can). Does the broody hen ever get off her nest? (yes, to eat, drink and stretch her legs). Owena also pointed out that Dottie had some fur shaven because she'd recently been spayed so she couldn't have puppies. Some people weren't sure if they liked that, so we chatted about it for a bit, and what it means to have puppies that then grow into dogs. Everyone thanked Owena for a lovely morning then got back on the bus to head back to Lewes. On a beautiful sunny April day, James from Square Lemon Training came along at lunchtime to give staff and volunteers some useful information about safe manual handling (ie lifting things), so that Sarah could then use that knowledge for planning tasks at the allotment, as well as for making sure people that come to the allotment take care of their backs. But which seeds shall we plant? The word 'manual' comes from using your hands (moving people is a different proposition, and these days, care workers are taught to safely use hoists etc). James told us that back problems can be both acute (sudden onset) and chronic (built up/last a period of time). Our backs are naturally 's' shaped, there is a curve, so you shouldn't literally straighten your back - the curve is there to provide suspension. Having slightly bent knees is a more stable standing position than having locked knees. We are also more stable if our feet are not close together, and we all have a dominant foot that we tend to put slightly ahead of the other one. Twisting often poses a high risk for backs, and should be avoided. James emphasised the importance of careful planning for all tasks. In some instances, this might lead to the tasks not being done, because you might assess that it is not safe to do them (because the objects are too heavy, or the ground is not stable enough, for example) or, on balance, that it is not essential that they happen. 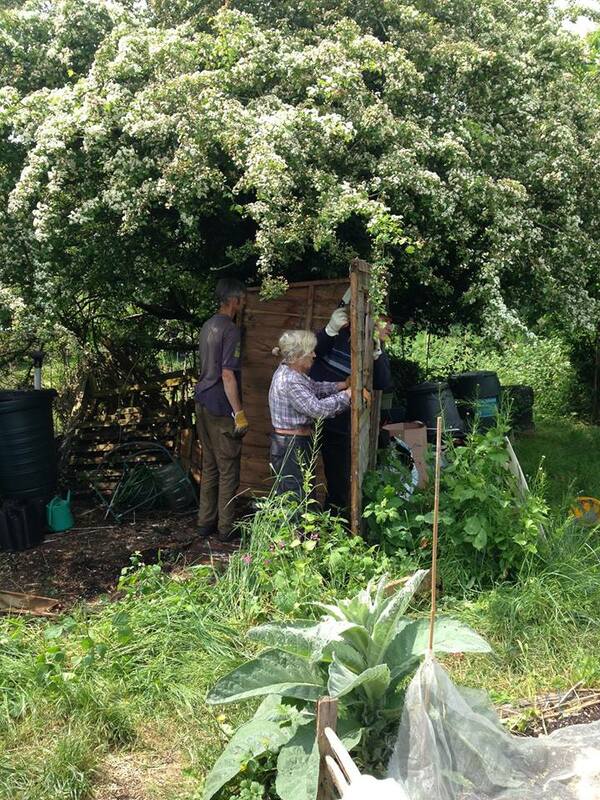 Good inductions are really important in any "work place", including an allotment where volunteers, clients and members come along to carry out tasks. He suggested that, as quickly as possible after a new group or person starts with us, we offer basic manual handling advice, along with a tour of the site. ENVIRONMENT the space around- do you have access? Is it firm underfoot and clear of obstacles? Think about any task in advance and do a risk assessment - ask why are we bothering moving it? Is it really necessary? It's a good idea to ask a group in advance of doing any tasks if anyone has back problems. Think about how to manage each job safely. Split the task up - have a rota so no one person is doing all the lifting. It's much easier to move an empty object such as a plant pot than a full one. Or dry soil rather than wet. Use a wheelbarrow when you can. Position it as close as possible to the load. Take a step rather than twist (eg as you put soil in). So position yourself so you are straight on. James then left, and a little later, the Plumpton College Rural Pathways group arrived. After welcoming them and asking one student to take the register, Sarah talked through the principles of safe manual handling and back care, whilst I demonstrated using a pile of empty pots. Then one group planted seed potatoes, whilst the other planted seeds, then the groups swapped tasks. Later in the session, a load of top soil bags were delivered near the allotment gate, and the group brought the bags into the allotment in pairs, using wheelbarrows and the principles of safe lifting that they had learnt. The group from Bluebell House enjoyed some hot cross buns and a bit of puppy love from Dottie at their last session before Easter. There is a new weather vane outside the therapy room made from a pheasant feather. We fed the chickens, took a look at the new-born lambs with their mums that were having extra care in the stables, then headed out along the muddy lane to feed the pigs and see the ponies. The ponies were pleased to see us, and enjoyed their hay. Unfortunately, the awful weather had caused the battery to go flat for the electric fence keeping the weaners in, and we found them making a determined effort to escape by digging. We distracted them by mixing and giving them food whilst Owena put a new battery in place. Then we headed back to the therapy room. Farm update from Owena, 16 April 2018: Lambing is now over. 54 lambs have been born. No ewes were lost, although a couple needed some extra care. Penny has just had her piglets, but unfortunately, due to the difficult weather conditions, the extreme mud and some bad luck, only two have survived. We've been busy with lambing at Baulcombes. The first two sets of twins went outside after being inside for twenty four hours to form mother and lamb bonds. The ewe who had thought she had had lambs, eventually had triplets! She has done very well especially because she had become very stressed looking for her lambs all the previous day. Also, she had been scanned for twins, so hadn't received extra food rations! We tube-fed extra colostrum to the new born lambs to give them a boost, it seems to have worked, today mother and three lambs out in the field. Saw lots on our 'signs of spring' walk today - wild violets, bumble bees, lambs, skylarks, and the tiny delicate jewels of hazel flowers. A common lizard was warming itself on the tyre by the pond. Leeks, kale, Japanese salads, herbs and brussels sprouts were all picked today in the sunshine - but look out for a cold snap again this weekend...!